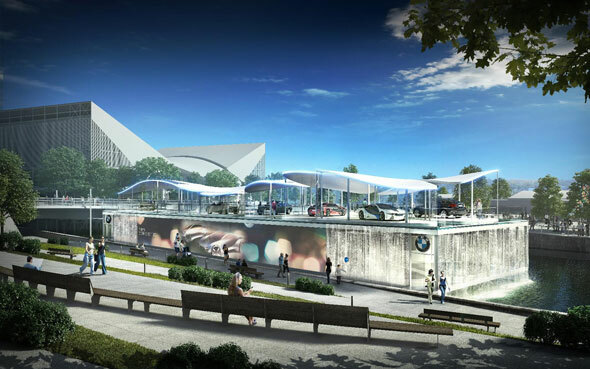 BMW has revealed the stunning new pictures of its pavilion in the Olympic Park. 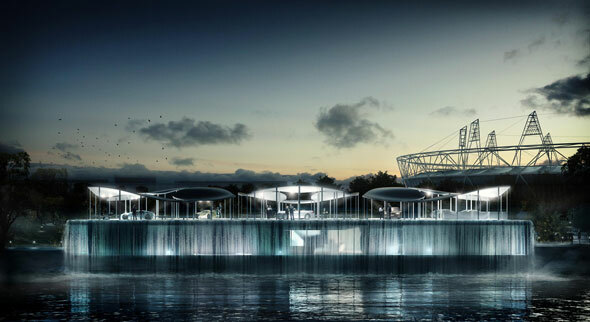 The pavilion will be the centrepiece of the luxury carmaker's deal as Official Automotive Partner to the London 2012 Games, housing a selection of new models on plinths suspended over water. A fleet of around 4,000 vehicles will be provided to transport athletes and officials during the Games. The fleet will use a mixture of electric, hybrid and low-emissions diesel cars to meet the emissions target of 120g/km CO2. BMW expects over 8,000 visitors every day during the Games and Serie, the company contracted out to design the building, will use river water to sustainably cool the building and make a striking 'water curtain'. Tim Abbott, Managing Director, BMW Group UK comments: "As a major investor, manufacturer and employer in the UK, BMW Group is deeply proud to be an official partner for Britain's first Olympic & Paralympic Games since 1948." "This commitment to the UK is also reflected in our choice of a home-grown architecture practice to design our pavilion and we're delighted that Serie's final design reflects our commitment to sustainable thinking in such an innovative and eye-catching manner. We believe it provides a truly worthy addition to the Olympic Park". As a BMW ambassador for the Games, GB Volleyball team player Zara Dampney (pictured below, right) will be on site as celebrations get under way. A range of visitor exhibits will also be on show on the lower floor with Rebecca Adlington, Tom Daley, Louis Smith and David Weir.